Wedding Videos, What's Included ? Its YOUR wedding, so why should any supplier try to tell you what to do, or make you pick from one of his Packages... it should be Your day... done in Your Way. Gerry wont offer you a Package; he will sit with you and discuss all of your needs and wishes. Once you have both agreed on what you want recorded; he will then give you an accurate quotation for exactly that, based on a simple hourly rate. Some brides want the minimum fuss on their day, with a simple recording of their Church or Civil Ceremony. Other brides want everything recorded from they get out of bed that morning, until its time to go back to bed again. Gerry will personalise your day in Your Way, from as little as 800 euro, to almost twice that. You dont even have to decide what you want recorded; until the day of the wedding itself. He is that flexible. Filming can start by visiting the Bride or Grooms home if you so desire. 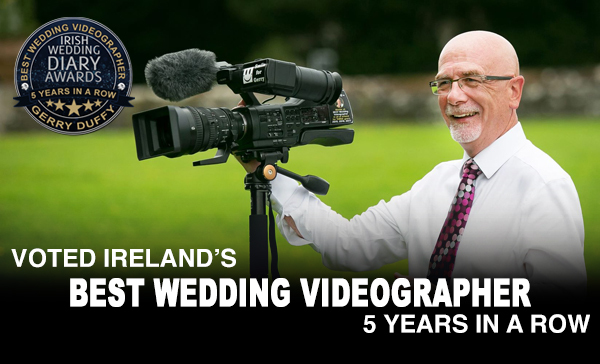 Alternatively, many brides will ask Gerry to start filming your guests arriving at the Church or Civil Ceremony venue. Gerry remains with you until you feel that you have recorded enough. For some brides this may be at the end of the Photo Shoot before the meal. Other couples want him to record until the end of your speeches; later that evening. Many families are so pleased with how discreetly Gerry operates; that they want him to remain into the evenings dancing to catch all the fun and frolics that take place during your Wedding Reception as your guests enjoy your wedding band. What About Budgets And Payment Plans ? This payment plan has been created by Gerry, to make it easier for couples to have a professional wedding video, even though their wedding budget may not seem to allow for it. You simply decide how much you would like to pay per month; and how many months you would like to spread the payments over. You dont even have to pay the entire amount in advance of your wedding. Many couples extend the payments until after the wedding is over. There is No added interest, and No additional charges. It is simply another option to make it easier to have what you truly deserve. Gerry will be delighted to personalise your wedding in any way that you wish. You can discuss a huge array of additional options, when you meet. Your Wedding on Your Facebook Page: your Directors Cut can be converted into a web format to view online or on Facebook.